Product Condition: The Charge Wireless Activity + Sleep Wristband is in Excellent condition. This item is the 2016 model. It is unused and has no defects. Energize your day with the Fitbit Charge Wireless Activity + Sleep Wristband. This fitness watch monitors sleep and tracks steps taken, distance traveled, floors climbed, and calories consumed and burned. Sync your stats wirelessly to your smartphone or computer from up to 20ft away and view your progress in easy-to-read charts and graphs. See daily stats, time of day, day of the week, and exercise mode on the OLED display, as well as who's calling you with the synced caller ID feature. Get the most out of your R.E.M. cycle with the sleep monitor to see just how long and how well you're sleeping throughout the night. The unremitting battery lasts 7-10 days, while this tough timepiece is splash and rain-proof to keep you crushing your goals, even in inclement weather. 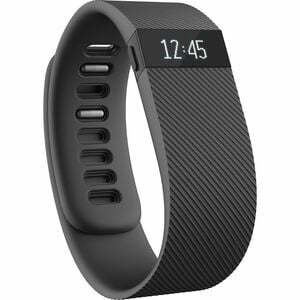 Fitbit Alta - NEW IN BOX!